Adding glitter to a plain shirt, pant or t-shirt would make it one of our favourite clothing to wear. I used the iron-on fashion design pack Tulip Glam-It-Up I bought from Walmart to easily add some glamour to this simple white t-shirt for my daughter. 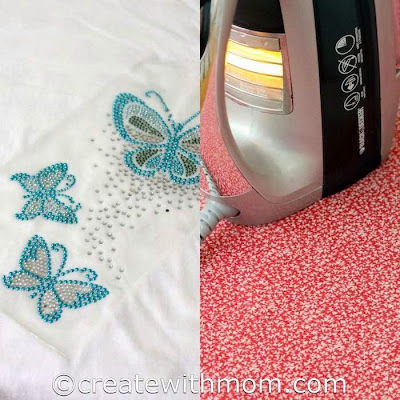 We can do this fun and easy project on pre washed fabric that is at least 50% cotton. The iron must be put in wool setting. I used our Black and Decker steam iron with an extra large non stick INOX stainless steel soleplate that glides smoothly over all types of fabrics. Then we peel the backing of the design and position it onto the surface with the plastic side up. Cover with a thin cloth, then press and hold the iron over the design for 45 to 60 seconds and let it cool. Remove the plastic and turn the cloth inside out. Iron the back of the design for 15 to 20 seconds. This fun iron on project gives a beautiful look to a simple plain t-shirt. Would be a great project to do with kids on a rainy day! Love this idea, excellent for personalizing gifts. Thanks for the post! Who knew it was so easy to do? This is so pretty and yet so easy! what an easy and creative way to spice up any clothing! This is a project I would like to do with my grandkids as it looks fairly simple and they would enjoy wearing their shirts they decorated themselves. What a cool idea - my oldest granddaughter would love this! What a great idea! Looks so pretty too. I think this would be a great project to do with the kids. It does look great. That's a really fun and cute thing to do for kids clothes. Would be neat on canvas sneakers too.